After a very short delay T-Mobile launches this slate, thus becoming the first U.S. carrier to offer the HTC-built LTE Nexus 9. T-Mobile had plans to launch the Nexus 9 tablet in early December, but they announced a delay. While the carrier's message revealed that this 9-inch Android slate would go on sale "on a date to be determined," it seems T-Mobile users are quite lucky after all. Google Nexus 9 arrives just a few days off schedule and makes T-Mobile the first US carrier to add it to the portfolio. 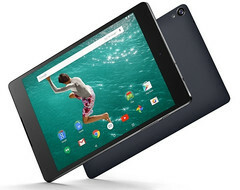 This 32 GB 4G LTE version of Nexus 9 has a full retail price of $599.76 USD, but can be acquired from T-Mobile for $0 down and 24 monthly payments of $24.99 USD each. Various offers can be purchased with the tablet as well, such as Free Data for Life (200 MB of free data each month as long as the customer stays with T-Mobile) or the Simple Choice voice plan.